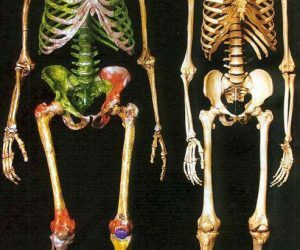 Early Hominids: The first fossils of erect bipeds with our general body shape (called hominids) appear in Central Africa about 6.5 million years ago (mya). Until recently, the hominids were thought to have been limited to East Africa, but a recent find from Chad, called Sahelanthropus, indicates that the early group of hominids is quite diverse, both anatomically and geographically. Sahelanthropus is so far represented only by skulls and teeth, but is clearly a hominid because of the small teeth, (especially the canines), the short face, and upright posture (estimated from the position of the foramen magnum). The next hominids come from East Africa and are dated to between 5 and 2 mya. Figure 1: The nearly complete skeleton of an adult female Australopithecus afarensis, approximately 3.5 million years old, from Ethiopia. Postcranial bones indicate upright posture and walking gait essentially the same as in modern humans. They were represented by Ardipithecus and Kenyanthropus, followed by Australopithecus. This last genus contains the most famous of the early hominids — the “Lucy” skeleton discovered by Johansen in 1974 (Figure 1) and the remarkable footprints discovered by Leakey in 1978.These hominids are intermediate between modern humans and apes, with a small brain and slightly elongated arms, though with completely upright posture and walking gait. They are not known to have used fire or made tools. They are also not known to have ventured out of Eastern and Southern Africa. Even though they have been divided by some investigators into several genera (Sahelanthropus, Ardipithecus, Australopithecus, and Paranthropus),it is still unclear whether the early hominids were simply diverse within a widely-distributed group (for example, like modern humans), or whether they represent more than one evolutionary line. For example, the discovery of Kenyanthropus has prompted the suggestion by Leakey et al. that this genus, rather thanAustralopithecusas known by the Lucy material, was the precursor of later hominids. They propose that Kenyanthropuswas ancestral to Homo rudolfensis,already known from East Africa. Further study will be required to confirm or refute this idea. By 2 mya, the first members of the genus Homo, called Homo habilis, had evolved in Africa (Figure 2). They did make tools, though it is not known whether they used fire. Homo erectus seems to have rapidly spread throughout Africa, Europe, and Asia (Figure 3), (Figure 4) . 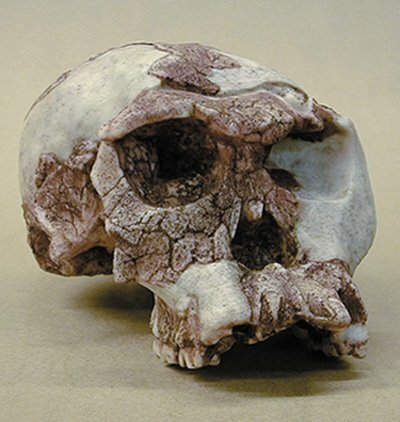 Figure 2: The skull of a Homo habilis from Olduvai Gorge, East Africa, approximately 1.9 million years old. Cranial capacity is just under 600 cc. Recent discoveries of hominid fossils in Georgia (between the Black Sea and the Caspian Sea), dated to 1.75 mya, have made the question of the migration out of Africa more complex, since these fossils resemble Homo habilis as much as they resemble Homo erectus, and they have left tools that look like those of Homo habilis in Africa. Figure 4: Sculpture of probable appearance of Homo erectus from China. 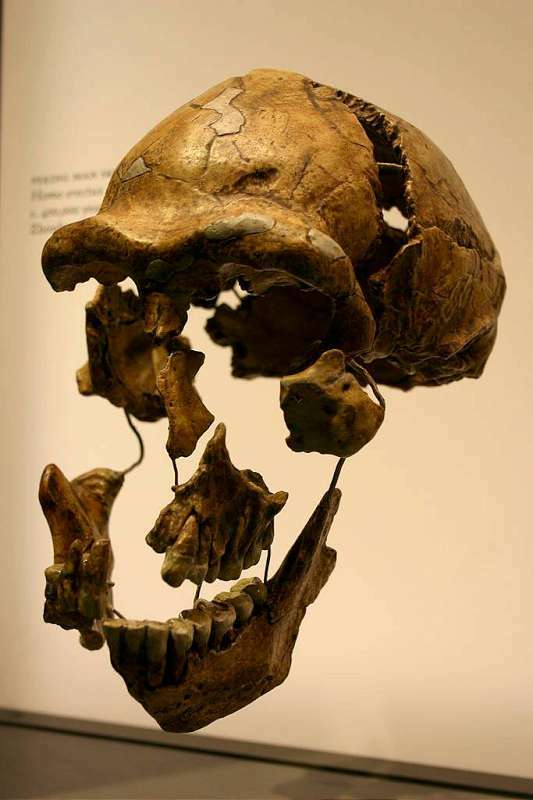 Figure 5: Left: skull of Homo erectus from the Atapuerca site in northern Spain. Right: reconstruction of his appearance based on skull morphology. 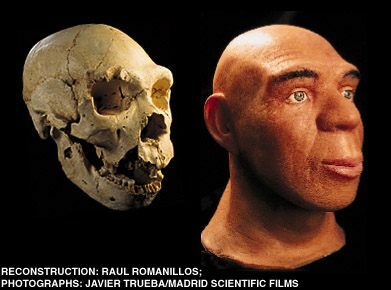 The European history of Homo begins about 800 thousand years ago (kya), when Homo erectus moved into Spain (Figure 5) and inhabited at least the north-eastern part of the country. These people are also found in southern France at a later date (450 kya). Other skulls, jaws, and long bones have been found in Germany and the UK, and may represent continued evolution of Homo erectus in Europe. One remarkable find is the Mauer Jaw (Figure 6) , a large mandible with all its teeth. It is often classed in a separate species, Homo heidelbergensis,but is most likely a large version of Homo erectus. They were fine tool-makers, making handaxes called “Acheulian”, after the French locale — St. Acheul — where they were first found; they also left much evidence that they used fire. Figure 6: Left: lower jaw of a Homo erectus-like person. Note the large size and lack of a chin. Dates to about 500,000 years ago. Right: jaw of a modern human. Neanderthals, the descendants of Homo erectus in Europe and Western Asia: The Homo erectus populations in Europe and the Near East lived for a half million years in Europe, then disappeared or evolved into the so-called “Archaics”. 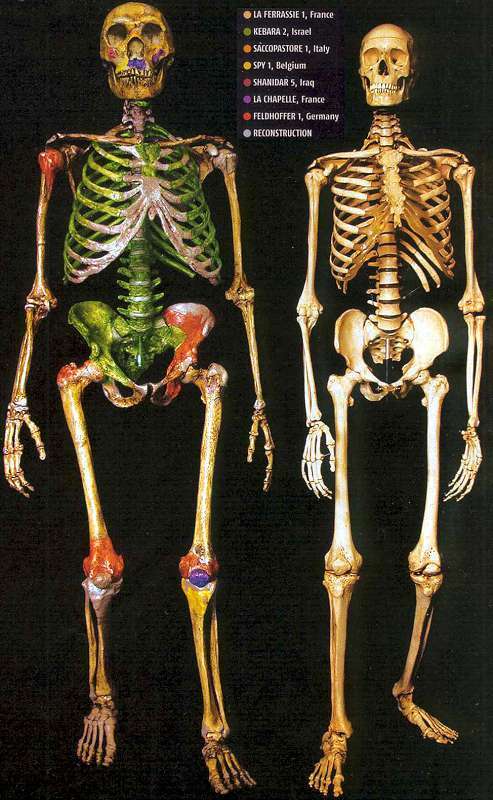 Though these archaics are poorly represented in the fossil record, they may be the ancestors of the Neanderthals. The Neanderthals are known from hundreds of specimens collected from hundreds of localities from Western Europe to Western Asia. They are not known from Africa or Eastern Asia. Brain size average 1500 cc (larger than ours). Cranium large, long, low with marked brow ridges. Forehead higher than Homo erectusbut lower than Homo sapiens. Face projecting forward; nose large. Front teeth large, heavily worn as if used as a vice to hold objects. Body shape that of modern Inuit or Lapps: short with broad hips. This even in the Near East when the climate was not cold, suggesting evolution from cold-adapted group during an earlier glaciation.